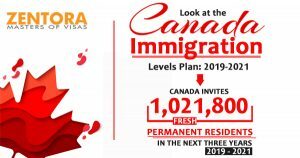 Canada has an ambitious plan to admit 1,021,800 fresh permanent residents (Canada Immigration) in the country in the next three years (2019 to 2021). This was announced by IRCC on Oct 31, 2018. Moreover, the target can be 1,080,000 in case the government achieves the upper range of the target. The Increase in the intake targets for various programs in the future will put downward pressure on the cut-off threshold of the CRS in Express Entry draws. The number of fresh arrivals migrating to Canada by using the Provincial Nominee Programs will also increase every year. Canada’s provinces are also eager to develop upon the opportunity provided by the federal government. They are keen to welcome applications in various PNP streams. Additionally, a few of them are aligned with Express Entry, and some of them also exist outside the federal system. Canada also has Family Class programs which have a plan to welcome 270,500 persons. These may be spouses, dependent children, and common-law partners, parents/grandparents of citizens and permanent residents of Canada. Finally, Canada will remain a safe destination for refugees or the persons needing a settlement. The target for them is 147,850, and the allocation is 13,750 for humanitarian and other causes. Furthermore, there is no determination and finalization of figures regarding economic immigration to the Province of Quebec. The reason is the recent election in Quebec. The government of Canada will establish the Targets after some consultations with the government in Quebec. The Coalition of Quebec has a plan of reducing the overall immigration levels to 40,000 per year. Presently it is 50,000 per year. The Canadian Minister of Immigration, Ahmed Hussen, states that the new immigration level plan aims to support employers and businesses of the country. It will ensure the presence of skilled labor spurs innovation and helps the country ahead at the global level. Moreover, it will build on a strong foundation and continue to increase economic immigration to stay competitive and attract fresh global talents. The 2019-2021 Immigration Plan does not include figures of temporary foreign workers as well as international students, who reach Canada annually. Please Contact Us.